Today I am looking at creative ways to add washi tape to your cards. These washi tapes from Altenew are very wide and cover an entire card base. They are so gorgeous and you get so much on a roll. I can't wait to create gift bags and boxes with this pattern as well! My cards today are a part of Altenew's 4th Anniversary Blog Hop. I am so grateful to be a part of the event! I also tried to use my absolute favourite Altenew products in today's video! 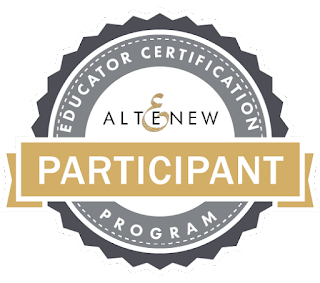 I thought I would share a little about Altenew! I first discovered Altenew when I saw their Roses Layering Stamp about three years ago. I had to have it! Since then, I've developed such a love for Altenew! My favourite thing (aside from the flowers) about Altenew is their beautiful sentiments. They are always so unique, heartfelt and personal. 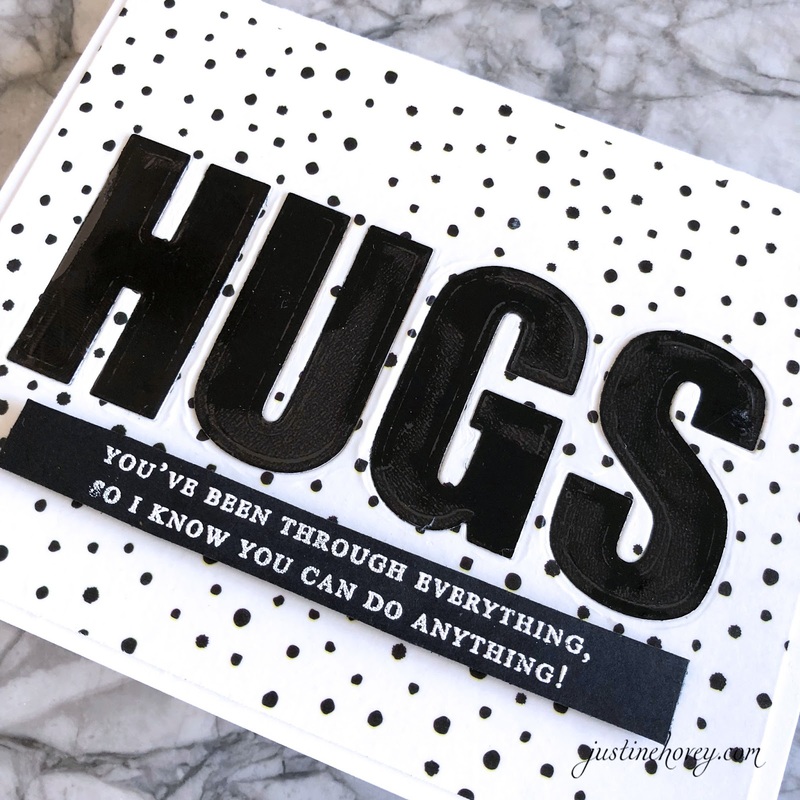 I created this card below by die cutting the Monochrome washi tape. I placed the washi tape on paper first to add thickness and stability. Then I die cut the Thinking of You image. When I was finished, I had two cards - one of the sentiment and one with the shadow of the sentiment. In order to make things stand out, I had to outline the image to keep it from getting lost on the white background. 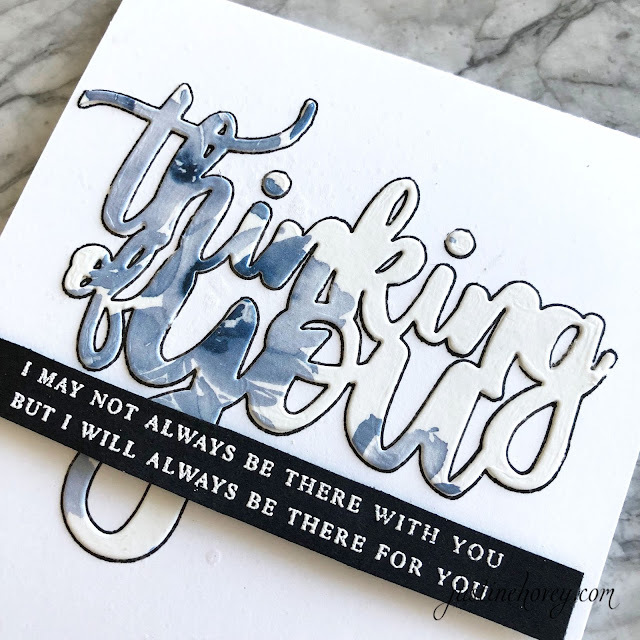 I think the black strip really makes the card pop - not only is the sentiment from the Dearest Friend Stamp so pretty in white, it truly is so encouraging! Here is the second card. I pieced all the little pieces back in to make the sentiment legible and I adore this background! FREE U.S. shipping with code HAPPY4TH or $5 OFF international shipping with code ANNIV at checkout. Offer valid from April 3rd until April 8th at 11:59 pm EDT. My second card features the Dotted washi tape and I used that as a background as well. I wanted to create another bold sentiment, so I created my own using the Bold Caps Alphabet die! The stamped sentiment is from another favourite stamp set of mine, Wings of Hope. This background needed a pop of colour so I sprayed some Antique Gold spray on the background. I was able to add the rest of the letters and then emboss the sentiment on black. I am submitting this card for the "In The Mood for Color" class - I was inspired to create with calm blues by instructor Stephanie Klauk! 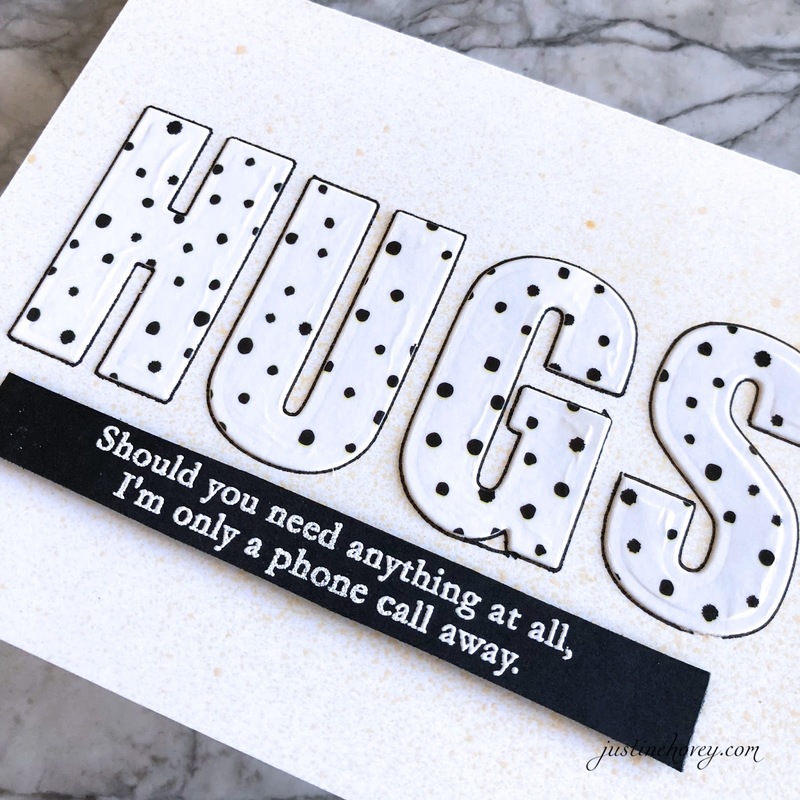 Thank you for sharing these card ideas, love these cards. I didn’t know they had washi tape that wide, what a great way to use the washi tape. Thanks for the great ideas. Your cards are wonderfully creative. I can't wait to try out some wide washi tape. What great inspiration! I love blue and white and you nailed it! Love the blue and white, love the use of your cut outs! Love your cards! I didn't know washi tape came in rolls that big! I'm going to have to give it a try! The Blue and White is gorgeous ! 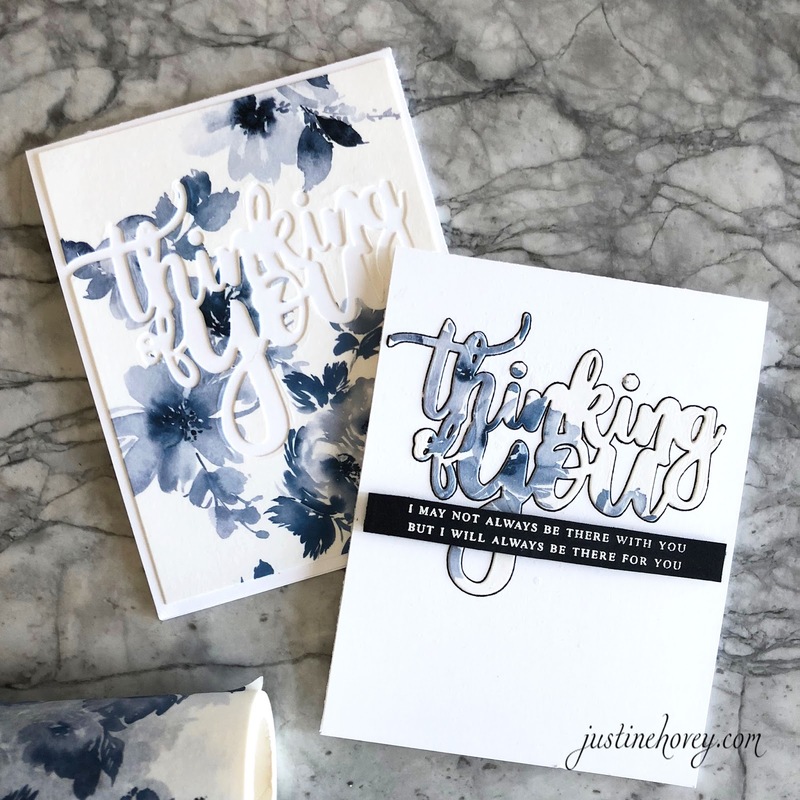 Awesome cards, Justine! Love the colors on that washi. Stunning cards!! I love the blue flowers, very elegant! Fantastic work! The first set of cards using washi tape is just gorgeous! Stunning cards! I love that you get 2 for 1 with the positive and negative of the die. These cards are beautiful, Justine! I love the blue, which is my favorite color. And, that washi tape is fabulous. It's gorgeous washi! And you did an amazing job making 2 cards in one go! As always, lovely cards and great ideas with lots of inspiration and tips and techniques. Love the use of negative space and nothing is wasted! Love that washi tape! Awesome cards you made too. I like the colors of those washi tape. Thanks for sharing and have a wonderful week. What a fun way to use washi tape! Great cards. Thank you for introducing me to Altenew Washi tape! I can't wait to give it a try using your great cards for inspiration. I have never seen this washi tape. Thank you for the introduction! Your cards are beautiful!! Oh, wow! All those cards are stunning! So very very pretty. I just love how you created 2 cards out of 1. Whenever I have tried it, only 1 seems to look ok. In both cases, both cards were stunning! Love it. I love the washi tape and how you used it to make two cards. It makes a beautiful background. Thank you for the great video! I do believe large washi-tape is in my future! I have both of these washi tapes and I have made a card with the blue and white one. Love the cards you made and the video was great! I love the way you used the washi! So cool! Thanks for another way to use Washi tape. I am sometimes lost on ideas for their use. Like how you made two cards with one idea. Love these Washi tapes! Beautiful!!!! Lovely designs Justine! What a fun use of Washi tape! Thanks for all you share! Love how you cut out and got 2 cards - so elegant. So pretty! 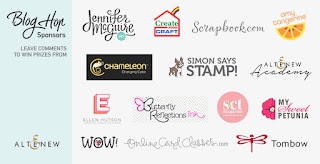 Love the washi tapes and the way you used the negative and positive die cuts for your cards! Can't wait to get some of this washi tape! As always Justine, your talent is so inspiring! Love these cards! I really like the wider washi tapes, great for a quick card on the run! Thanks for sharing such great ideas with all of us. I was trying to resist Altenew Washi tape-but now I can't. Great cards! Thanks for all the great ideas and the video. I love these cards! I need to buy wide washi tape and add it to my “must have” supply list! The flowered washi tape really creates a stunning card in the way you have used it! Both are great cards! beautiful cards and incredible washitapes, I'm in love with the first one on the first card !! Hey Justine I follow you on FB and love your videos , today I get to visit your blog :)Beautiful cards ! Beautiful products and beautiful cards. Thanks for sharing your process. I loved the die cutting and use of both the positive and negative spaces. Love your cards plus a twofer. How great was that!! The positive and negative equals 2 cards! Great job. I love all of them! I have the bold alpha set too and i love it! I agree Altenew has some of the best sentiments. Thanks for the idea on using washi tape with dies. Your card looks beautiful! I love the colors and innovative techniques!! dots. I always try to use my negative cuts if I can. Love how used the washi tape with dies. Thank you for the inspiration. Beautiful cards! Love your creative use of Altenew's washi tape. Like this idea. Will have to look into the wide Washi tape. I just love it. Thanks for inspiring. Love doing this type of twofers. Beautiful cards. I love how you find a way to stretch your supplies so well and in this case, making more than one card with one technique. I love it. Thanks so much. Wow!! I had no idea there was washi tape this wide or so pretty. These are awesome cards!! That washi tape is really cool. I love that it is so big and can cover the whole card! Love your use of the washi tape....I didn't realize it was washi tape!!! !..and the negative use of the die is amazing....bonus card everytime!!!!!! Beautiful cards Justine, very creative. I absolutely love the new washi tape, you’ve come up with a wonderful way to use them. Happy Anniversary Altenew!! Gorgeous use of that washi tape! Great tips and techniques. I love your designs. Just lovely cards. Those wide washi tape are very pretty. I liked how you used them to make your backgrounds. I wasn't aware of the larger washi tape and it's uses. Creative and beautiful! Thank you for sharing. 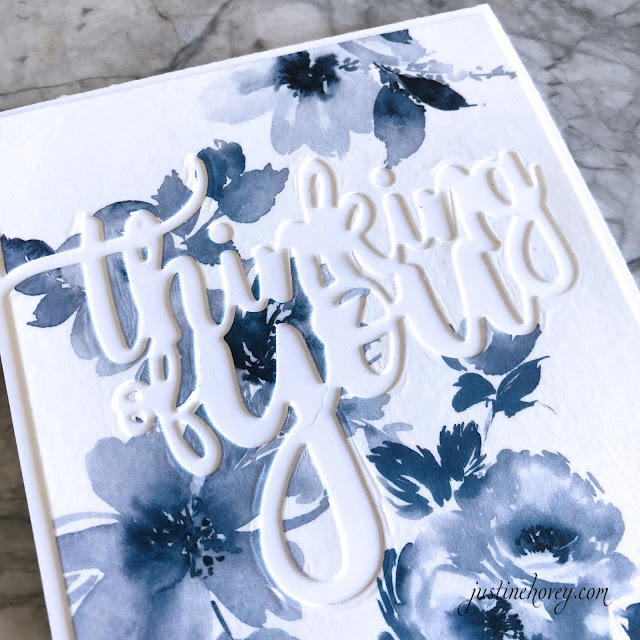 Gorgeous cards and love how you used the die cuts to create two cards. Very pretty! I just got my washi tapes. Couldn't wait to try them out! Beautiful cards! I love how you used the negative of the die cut for the sentiment. It is so unique and effective! And you are so brilliant to use the die-cut sentiment to create a second card, also very artistic. Love that Washi tape! Your cards are just beautiful! I love your ideas and Altenew! Thank you! I love the cards, so elegant! I didn't think I needed washi tape until I sent his video! Lovely cards, thanks for the inspiration! Awesome way of using Washi tape. It has open up my thoughts and mind about my sash of tapes. Thanks so much and God bless you for free advice and suggestions online. Love the cards. Love the wide washi tape! Loved your Washi tape card ideas. What makes me really enjoy your videos is how you reinvent the card when it’s not exactly “right on” for your taste. We all just keep going cause none of likes to waste product! Thanks Justine! I love what you did with these washi tapes - especially the floral ones. 3wow! What gorgeous washi tape! I had no idea that washi tape came in that size. I just *love* the blue floral tape. I'll definitely have to check out the other two tapes. Thanks for sharing. Very cool Washi tape technique! Thank you for sharing! I would of never guessed yhat was washi tape - love it! Never thought I would say I need more washi tape, but your card convinced me that I need the one you used!!! Love the blue floral Washi tape. Thanks for your ideas. Beautiful. Clever idea. No those large letter dies need to join my stash soon. Amazing uses show up in my blog feed daily. As always Justine I love your cards and I'm always learning something new from you. Thank you for sharing with us all! There are some really pretty washi tape patterns. Nice easy way to make quick backgrounds. Ingenious use of washi tape. Love the card. I've been eyeing Altenew's washi tapes, they are gorgeous! Great use and super CAS cards. I always love your cards and videos! I was glad to see someone use the washi tape. I didn't know if it could be just cut or needed to be folded over the cardstock. Love the two-fers! What a clever use of the Washington tape. Loved the bold alphabet dies. Thank you for sharing. Justine, your cards are beautiful! You show off Altenew products wonderfully! Thanks for your inspiration! So pretty - love the die cuts and the blue and white color combo. I just love those huge washi tapes! I have got to get some of those! Beautiful cards! Awesome inspiration with washi tape!! When I first arrived at your blog & saw the blue & white flower card I thought you had watercolored it!! Great cards. Thanks for sharing with us and for inspiring us. Love that washi tape. Watched your video. I love your ideas and I love finding new ways to use washi tape. I love it when the colors complement the sentiment! Lovely cards! Your ideas are awesome. Love the die inlays and making two cards out of one. Beautiful cards Justine, I do love the wide washi tape and I have the Bold Alphabet die set in my wish list. I am loving the new wash tape! 2 for 1s are especially awesome when they are so pretty! Thanks for sharing, and happy birthday, Altenew! That washi tape is huge I have never seen it like that. These cards are a great way to showcase this. What a way to end the hop and show us innovation of altenew bravo. I am loving all the cards using the new Washi tapes! I definitely need to get the rest of them so I can use this technique! TFS! The Altenew washi tape is beautiful and so are your cards! Really like how you used the Altenew washi tapes on your cards! Elegant and fast! Gorgeous cards, what a great idea having wider washi tape. WOW ! Your cards are just stunning ! Thank you for showing how to use the washi tapes to make gorgeous cards! Thank you for the inspiration. Love this washi tape even more now!! Definitely need to get some. These cards are great....so simple, especially when you get 2 from 1! I love two for one cards! Beautiful design and lots of fun inspiration! Thanks for the blog hop! These are all so stunning!! I love the beautiful designs of each one!! Thanks for the amazing inspiration!! Beautiful, encouraging cards! Thanks for sharing your creations. First I have seen wide washi tape. Very inspiring, yet simple to make with great sentiments. Just a little extra time to put in all the pieces. Your washi tape cards are stunning, in calm blue and lots of white. Oh, drat! Now I will never be able to throw away scraps of cardstock! The blue in particular is just so pretty. Wonderful cards, complete with "how to fix" tips--a perfect video! Thanks so much. The Altenew blue floral washi tape is gorgeous! 4 beautiful cards!!! Love the washi!!! Thank you for your great ideas! Love these Washi tapes and their size. They are on my wish list and you've given me lots of inspiration for their use with your beautiful card ideas! Love the larger Washi tape and what you can do with it. Absolutely beautiful cards. Using these great Altenew products you showed us how to double dip by getting two cards out of one. Thank you! Very cute. Love the lettering ideas. Such great cards, thanks for sharing. More creative cards! Loving the new Altenew release! Your cards came out fabulous! Really loving that super wide washi tape. Thanks for the inspiration. Fabulous! This is not the everyday washi! So pretty! Love the blue and white. Two cards from one is great. Wow, washi that big. Fantastic cards Justine. Love how you used the negative and positive images! Especially the pretty blue washi tape cards! BEAUTIFUL use of these dies and Washi tape, Justine! I am so glad that you enter your beautiful work in Altenew AECP assignment Gallery. Awesome details and design! Super work! Very creative! I see this washi tape on projects and just love it! The designs you created highlight it so well! I always love your cards and I really like that blue floral washi tape! 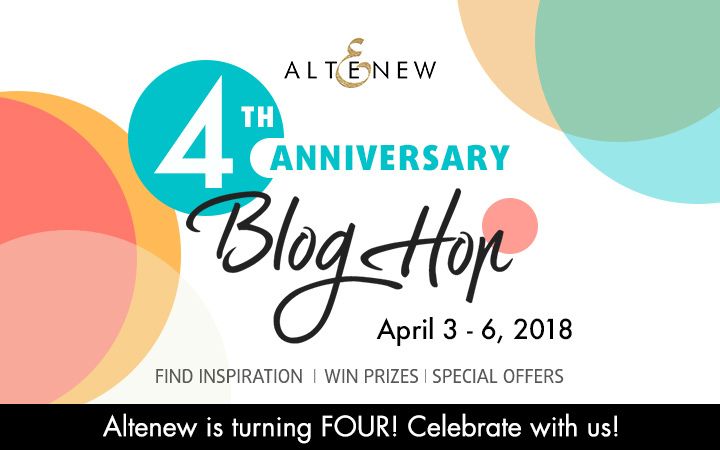 Congrats to Altenew on 4 years! Amazing cards! I love how you outlined the words, that small detail really did add that pop! That was suppose to say washi tape. Darn spell check! I've not seen this wide washi tape before, but I love it and how you've used it. Love when you get a 2 for 1 on a card project. Brilliant! Thanks for sharing these cards and video with us. Justine, your washi cards are awesome! I love that Bold Alphabet and how it looks on your cards! I can't wait to watch your video to see how you made your cards...I so appreciate when designer take the time to make a video!! Love the beautiful Washi tape, You made them shine on your cards. Great ideas and great cards! I love the card with the foil! You used the wash take so creatively, I actually thought the blue flowers were cut out until I watched the video and saw how you did it. I agree that the black foil letters really popped with the black and white dots. Loved the cards made with washi tape, love the colour too. Gorgeous cards! Love, love, love the blue. Love these! The washing tape is ingenious! Stunning!! Justine, I love your cards and that you made two for each cut-out sentiment. What a great idea of having such wide washi tape! And I am so glad that you used it in your cards to give us ideas of what to do with it. Justine plus Altenew equals success! And your video gives such a clear idea of how you did everything! Washi tape is so fun and this size is incredible - beautiful simple cards - live them! Justine, You make the most prettiest cards!!!! You make it look so easy! I love the cut out sentiments and the wide washi tape!! Thanks for all the ideas!! I had no idea the tape came in this width. What a fun way to make a card! Beautiful cards. I would never have guessed that was washi tape. So cool. May have to get some of that! Love the use is Washi tape. So versatile... i need some of that whide washi for sure! I love the Blue washi tape and the way you incorporated into you Beautiful cards!! LOVE THEM!! Thank you for sharing!! Beautiful cards---LOVE the wide washi tape!!! Thanks so much for sharing!!! I wasn't aware that washi tape came in such wide widths. Thanks for sharing this with us. I love how you created your backgrounds using it. Your cards are stunning! Thanks for sharing your time and talent with us! Washi tape on the next level! I love the sentiment! Thank you for showing us to make these wonderful cards! Beautiful cards! I never really knew what to do with washi tape so thank you for your inspiration and know how on using all your supplies. I love the new wash tape, what a great way to use them and get two cards out of it! Just love your two for one cards. There all just lovely. I love your cards. Your video is nice and easy to understand. I get so excited to try them out for myself! Thanks for your tips too. I never thought of using purple tape to keep them inline. I love your cards, such great ideas. Thank you for sharing this amazing technique! These are beautiful cards and I would have never guessed they were washi tape! �� Wow! Love ❤️!